Finally, we are on our way to the Bahamas after being in Marathon for two months. We have a short two day window to cross the Gulf Stream. Many of the boats here at the Marina have canceled their trip to the Bahamas this year. The El Niño effect is causing fronts to come through every few days. The locals say this is the windiest winter they have seen in a long time. We have our fingers crossed that wind conditions will improve for April and May. It is an easy seven hour trip up the Hawk Channel to the anchorage. Having stayed here several times now, we have the routine down pat. There are about 10 other sailboats and one other Krogen already at anchor. No worries, there is room here for many boats. We are underway at first light for our passage to South Bimini. The Krogen that was at anchor left just before us and seems to be heading the same way. He was anchored too far away from us last night to get his name. Maybe we will see them in Bimini. The forecast was for 2-3 ft seas. Once in the Gulf Stream, we are seeing 3-4 footers on our starboard quarter. It is a little lumpy out here but IT handles it well. The Gulf Stream gives us a push and we rocket along at 11 mph. Our first task is to turn on the water maker and fill the tanks. Well….it runs for about an hour and we don’t see any movement in the tank gauges. Jeff goes down to check and finds all the water being diverted overboard. Hum!! As he switches the diverter valve, one of the supply hoses immediately blows a hole. A quick check of the spares reveals no spare tubing. We also suspect that the diverter valve may be bad. None of those in our spares either. Now what? We will deal with this once we get to Bimini. The fishing rods are soon deployed. After about an hour, one of the reels starts singing. Jeff goes back to check and yells “ fish on”. 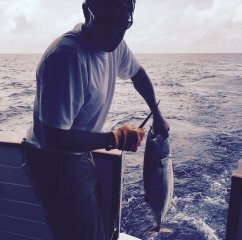 With the high seas and heavy freighter traffic in the area, I take the wheel while he handles the fish solo. A good size Mahi is soon on the dive platform. As he reaches for the gaff, he sees the hook come loose and the Dolphin sliding back into the sea. Dang!! It is really hard for just one person to get a fish in but with these conditions we had no choice. Another hour passes before we have a second strike. I tighten down the drag but this guy must be big. It doesn’t slow him down in the least. I retreat up to the pilot house while Jeff manhandles the rod. He is not letting this one get away and is soon filleting a 20 lb black fin tuna on the swim platform. The yellow quarantine flag is hoisted as we approach Bimini Sands Marina on South Bimini. Idyll Time is secure in her slip by 5:00 PM. Next step is clearing customs. The dockmaster supplies us with the paperwork and calls us a cab. Customs is at the airport a few miles down the dirt street. They close at 6:00 PM. It is an easy process. We give the customs guy our paperwork along with the $300 cash fee and he gives us our cruising permit good for one year along with a three month fishing license. It is a very lax process, no quarantine and no boat visit by Customs. Is it this easy throughout all the islands? They didn’t even ask about pets. Maybe we should have brought Nate( see previous logs). The Bahama’s flag is up and the quarantine flag stowed. The next few days are spent exploring while we wait on another weather window. 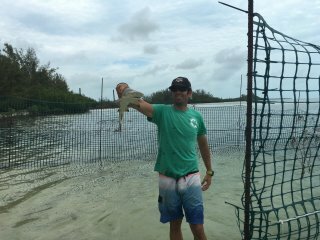 There is not much on South Bimini other than our Marina/ resort, the airport, and the Bimini Biological Field Station shark lab . We sign up for a tour of the shark lab given by one of the grad students. Established in 1990, the facility studies Lemon, Great Hammerhead, and Tiger sharks. Many of the sharks are tagged and DNA sampled. South Bimini is a major nursery area for the Lemon sharks. 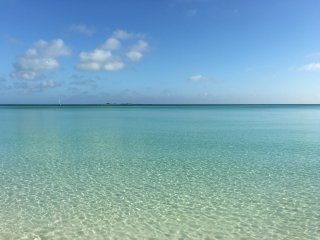 Alice Town on North Bimini, a short maybe 300 yards and $2 ferry ride away, is the hub of the island community. Most of the shops are closed for Easter weekend holiday. 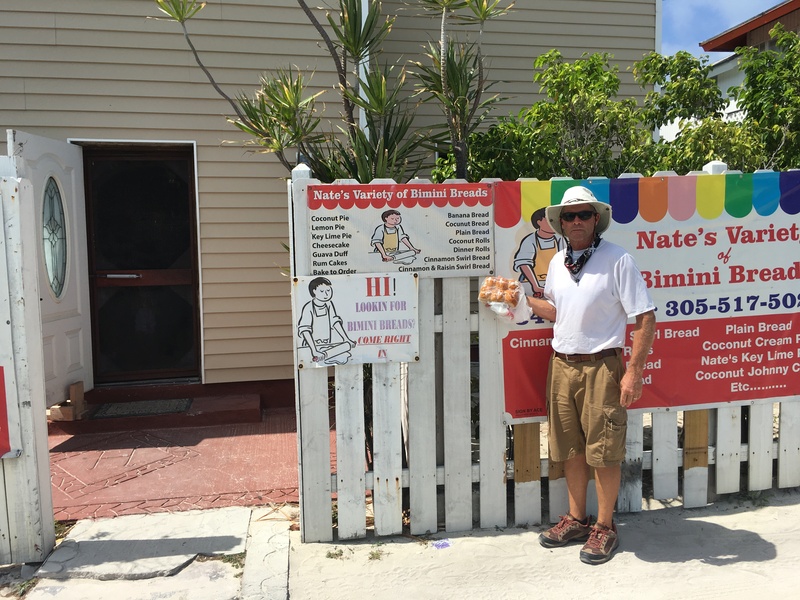 Discovering a local house advertising Bimini Bread, we peer inside the scree door to see if anyone is there. An 8 year old boy greets us and is soon selling us one of his favorites, Easter yeast rolls. 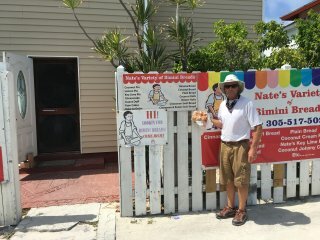 We find one other home bakery open with a nice elderly lady selling hot fresh Bimini loaf bread. Half of the loaf is consumed while exploring the town. Wish you could get bread like this back home. Poking around the docks, we spy another Krogen. It is HoBo, the 42 foot that was in our anchorage at Rodrigues a few days ago. Larry and Lena along with their dog Morgan are from Sitka,Alaska and sailed from the Pacific Northwest four years ago and are now exploring the U.S. East coast and Bahamas. 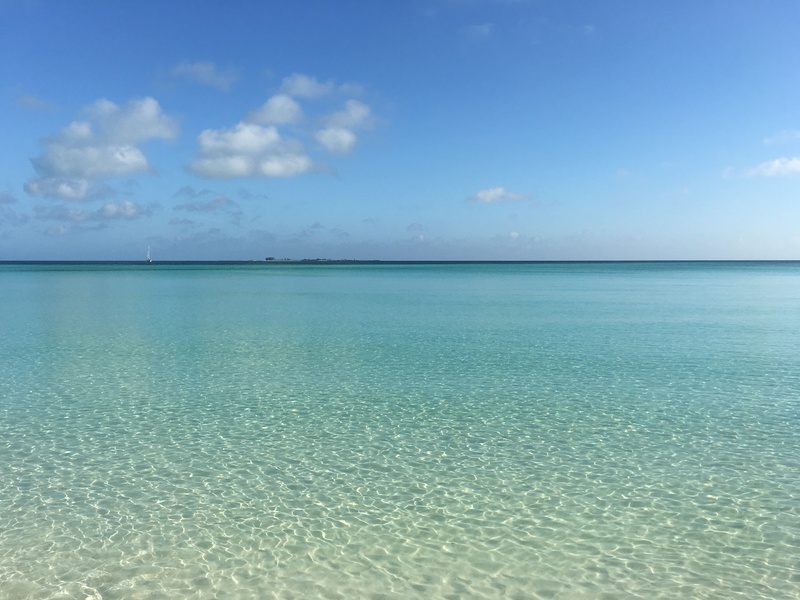 Two days is more than enough to see all of Bimini. The island seems to be struggling economically. The town is dirty, littered with trash, and houses in disrepair but the locals seem friendly and eager to accommodate. We will head to the Berry Islands tomorrow. This entry was posted on April 2, 2016 at 1:07 pm. You can follow any responses to this entry through the RSS 2.0 feed. You can leave a response, or trackback from your own site.